If you’re experiencing the symptoms of anxiety, stress, or depression, you’re probably acutely aware of the impact on your mental health. But there are also a number of knock-on effects that can impact your physical well being. Anxiety weight loss is one such consequence. Like many, you may associate anxiety and stress with weight gain rather than weight loss. This is understandable as, when you’re feeling anxious, your body releases large amounts of the stress hormone cortisol. This contributes to weight gain, particularly around your middle, due to your body believing starvation is a very real possibility during these stressful times and, therefore, hanging on to the fat you eat or have present on your body. It tends to move fat to your abdomen (which has more cortisol receptors) from healthier areas, such as your backside or hips. Feeling anxious and depressed can also lead to long periods of inactivity. When you’re lethargic and devoid of motivation, the idea of pulling on your running shoes or hitting the gym is positively grim. However, for many, the complete opposite will occur. Instead of stepping on the scales and seeing the numbers tick ever upward, you may actually witness a decrease in your weight. Sudden weight loss can be quite alarming as it tends to be associated with serious underlying illness. For the sake of peace of mind, and to ensure you don’t worsen your feelings of stress and anxiety by worrying about your health, it’s worth speaking with your physician and ruling out any physiological causes. Once you’re satisfied that there are no other underlying health issues, you can focus on addressing the anxiety-related causes head on. To that end, here are a number of factors at play that can cause anxiety weight loss. One of the most prominent reasons behind anxiety-related weight loss is a lack of appetite or a disinterest in food. This is typical for those who suffer from depression, but it’s also true for anxiety. Feelings of hunger start to dissipate, and you begin to eat less than you would normally – and less than you perhaps need to. You may not even realize that you’re not eating as much or as frequently as normal, and the downside to this, beyond the initial weight loss, is that it can slow your metabolism. Then, once you start eating again, you’re likely to gain weight faster. Another reason why you may be eating less is that your body is over-stimulated by stress-response hormones, which can cause stomach and digestive issues. It goes without saying that, when you have an upset stomach, you tend to avoid eating, and by eating less, you force your body to seek out alternative sources of energy – namely, the fat stores. As your body burns the fat for fuel, you lose weight. The next reason is one you may not have considered as a cause for weight loss. Feelings of anxiety or stress can make you restless. Some of you may experience ticks or leg shakes while others find themselves pacing from room to room. All this additional, unintentional movement requires energy, and if you’re not eating enough to fuel this nervous energy, you’ll certainly see a decrease in your weight. The fight or flight response will typically increase your metabolism as your body burns more energy in preparation for the need to either throw down in fisticuffs or flee from a threatening situation. The body’s chemical response to stressful situations also plays a part here, releasing stress hormones into your bloodstream to enhance your body’s ability to defend itself. Once again, all of this requires energy, and if you aren’t fueling your body with sufficient nutrients, it will source the energy from elsewhere. For some, a change in lifestyle in response to your symptoms of anxiety and depression can contribute to weight loss. This could be as simple as drinking less alcohol because you’re not going out as much due to feelings of panic and social anxiety, which means fewer calories consumed. Or, if you used to regularly exercise prior to feeling depressed or anxious, you may experience a loss of muscle mass and, therefore, a decrease in weight. In other cases, weight loss may come from a positive lifestyle change when dealing with anxiety. It could be that you have chosen to eat better and exercise more, and, as a result, you will witness a genuine, perfectly healthy weight loss. 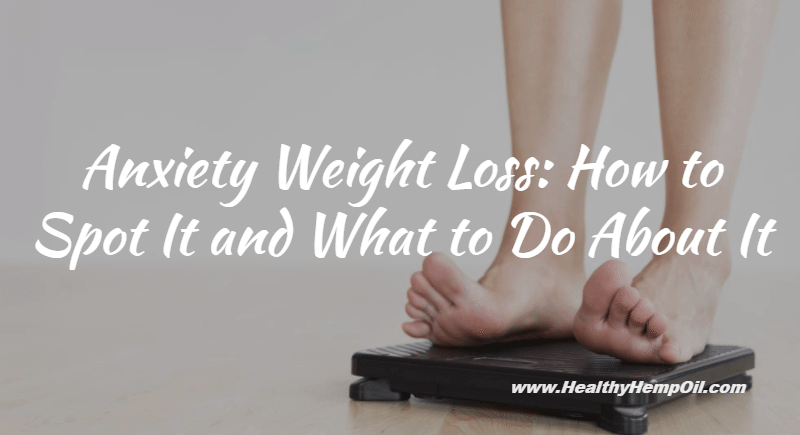 However, because your focus was on dealing with your symptoms of anxiety and depression, the unintended weight loss can cause you undue worry in relation to your general health and well-being. To effectively manage anxiety-caused weight loss, you must address the overarching anxiety issues. Only by reducing stress and anxiety and returning your body to a relative state of normality will you see a reduction in weight loss. Take steps to relieve stress and anxiety as much as possible. By doing so, you can reduce fuel consumption and, therefore, weight loss. Try to counter unintentional, additional movement caused by nervous energy by getting more rest and reducing caffeine intake. Follow an anti-anxiety diet, and eat more foods high in protein and carbohydrates. This can help offset the need for fuel. Try to slow your body’s metabolism by getting more rest and sleep. By slowing down your body’s metabolism, you can reduce fuel consumption. In summary, sleeping well, eating better and working to eliminate stress from your professional and personal life can help you manage your weight when experiencing symptoms of anxiety, stress or depression. Have you experienced anxiety-related weight loss? How did you effectively manage it? Tell us in the comments. Is Smoking CBD Oil the Best Method of Consumption?